Lepers, outcasts, those with HIV/AIDS, Hawaiʻi. Marianne Cope, also known as Saint Marianne of Molokaʻi, (January 23, 1838 – August 9, 1918) was a German-born American religious sister who was a member of the Sisters of St Francis of Syracuse, New York, and administrator of its St. Joseph's Hospital in the city. Known also for her charitable works, in 1883 she relocated with six other sisters to Hawaiʻi to care for persons suffering Hansen's Disease on the island of Molokaʻi and aid in developing the medical infrastructure in Hawaiʻi. Despite direct contact with the patients over many years, Cope did not contract the disease. In 2005, Cope was beatified by Pope Benedict XVI. Cope was declared a saint by the same pope on October 21, 2012, along with Kateri Tekakwitha, a 17th-century Native American. Cope is the 11th person in what is now the United States to be canonized by the Catholic Church. Cope was baptized Maria Anna Barbara Koob, later anglicizing her last name to "Cope". She was born January 23, 1838, in Heppenheim in the Grand Duchy of Hesse to Peter Koob (1787–1862) and Barbara Witzenbacher (1803–1872). The following year her family emigrated to the United States, settling in the industrial city of Utica, New York. They became members of the Parish of St Joseph, where Cope attended parish school. By the time she was in eighth grade, her father had become an invalid. As the oldest child, Cope left school to work in a textile factory to help support her family. Her father became naturalized as an American citizen, which at the time meant the entire family received automatic citizenship status. By the time their father Peter Cope died in 1862, the younger children in the family were of age to support themselves, so Maria pursued her long-felt religious calling. She entered the novitiate of the Sisters of the Third Order Regular of Saint Francis in Syracuse, New York. After a year of formation, Cope received the religious habit of the Franciscan Sisters along with the new name Marianne. She became first a teacher and then a principal in newly established schools for the region's German-speaking immigrants. Following the revolutions of 1848, numerous German immigrants entered the United States. By 1870, Cope had become a member of the governing council of her religious congregation. She helped found the first two Catholic hospitals in Central New York, with charters stipulating that medical care was to be provided to all, regardless of race or creed. She was appointed by the Superior General to govern St. Joseph's Hospital, the first public hospital in Syracuse, serving from 1870 to 1877. As hospital administrator, Cope became involved with the move of Geneva Medical College of Hobart College from Geneva, New York, to Syracuse, where it became the College of Medicine at Syracuse University. She contracted with the college to accept their students for treating patients in her hospital, to further their medical education. Her stipulation in the contract—again unique for the period—was the right of the patients to refuse care by the students. These experiences helped prepare her for the special ministry she next pursued. The Sisters of St. Francis, at the Kakaʻako Branch Hospital. Walter Murray Gibson with the Sisters of St. Francis and daughters of Hansen's disease patients, at the Kakaʻako Branch Hospital. Cope departed from Syracuse with six other Sisters to travel to Honolulu to answer this call, arriving on November 8, 1883. They traveled on the SS Mariposa. With Mother Marianne as supervisor, the Sisters' task was to manage Kakaʻako Branch Hospital on Oʻahu, which served as a receiving station for Hansen's disease patients gathered from all over the islands. The more severe cases were processed and shipped to the island of Molokaʻi for confinement in the settlement at Kalawao, and then later at Kalaupapa. The following year, at the request of the government, Cope set up Malulani Hospital, the first general hospital on the island of Maui. Soon, she was called back to the hospital in Oahu. She had to deal with a government-appointed administrator's abuse of the leprosy patients at the Branch Hospital at Kakaako, an area adjoining Honolulu. She told the government that either the administrator had to be dismissed or the Sisters would return to Syracuse. She was given charge of the overcrowded hospital. Her return to Syracuse to re-assume governance of the congregation was delayed, as both the government and church authorities thought she was essential to the success of the mission. Two years later, the king awarded Mother Marianne with the Cross of a Companion of the Royal Order of Kapiolani for her care of his people. The work continued to increase. In November 1885, Cope opened the Kapiolani Home with the support of the government, to provide shelter to homeless female children of leprosy patients. The home was located on the grounds of a leprosy hospital because only the Sisters were willing to care for children so closely associated to people suffering from leprosy. In 1887, a new government came into office. It ended the forced exile of leprosy patients to Molokai and closed the specialty hospital in Oahu. A year later, the authorities pleaded with Cope to establish a new home for women and girls on the Kalaupapa peninsula of Molokai. She accepted the call, knowing that it might mean she would never return to New York. "We will cheerfully accept the work…" was her response. Mother Marianne Cope (in the wheelchair) only a few days before she died. When Father Damien died on April 15, 1889, the government officially gave Cope charge for the care of the boys of Kalaupapa, in addition to her existing role in caring for the female residents of the colony. A prominent local businessman, Henry Perrine Baldwin, donated money for the new home. Mother Marianne and two assistants, Sister Leopoldina Burns and Sister Vincentia McCormick, opened and ran a new girls' school, which she named in Baldwin's honor. A community of Religious Brothers was sought to come and care for the boys. After the arrival of four Brothers of the Sacred Heart in 1895, Cope withdrew the Sisters to the Bishop Home for leprous women and girls. Joseph Dutton was given charge of Baldwin House by the government. Cope died on August 9, 1918, due to natural causes. She was buried on the grounds of the Bishop Home. In 2005, her remains were brought to Syracuse for reinterment at her motherhouse. In 2014, her remains were returned to Honolulu and are enshrined at the Cathedral Basilica of Our Lady of Peace. 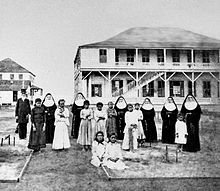 1927 — Saint Francis Hospital was founded in Honolulu in her memory as a community hospital and to train nurses to work with Hansen's disease patients. 1957 — St. Francis opened the Child Development Center at the Honolulu Community Church. 1962 — St. Francis Home Care Services was established, the first in Hawaii to specialize in home health care for Hawaiian people. 2005, Induction into the National Women's Hall of Fame. 2006 — The Sisters of St. Francis chose to focus on long-term care, transferring the two facilities of St. Francis Hospital to a private board. The facilities are now known as the Hawaii Medical Center East in Liliha, and Hawaii Medical Center West in Ewa. Both hospitals were closed at the end of 2011. In August 2012, The Queen's Health Systems agreed to acquire the former Hawaii Medical Center West and reopen the hospital in the fall of 2013. The Saint Francis School was founded in Mother Marianne's honor in 1924, operating as a girls-only school for grades 6-9. The community which Cope founded on Molokai continues to minister to the few patients afflicted with Hansen Disease. The Franciscan Sisters work at several schools and minister to parishioners throughout the Hawaiian Islands. In 1993, Katherine Dehlia Mahoney was allegedly healed from multiple organ failure after praying to Marianne Cope for intercession. On October 24, 2003, the Congregation for the Causes of Saints declared Mother Marianne to have been "heroically virtuous". In April 19, 2004, Pope John Paul II issued a papal decree declaring her Venerable. On December 20, 2004, after receiving the unanimous affirmation of the Congregation of the Causes of Saints, Pope John Paul II ordered a decree to be issued authenticating this recovery as a miracle to be attributed to the intercession of Mother Marianne. On May 14, 2005, Marianne was beatified in Vatican City by Pope Benedict XVI in his first beatification ceremony. Over 100 followers from Hawaiʻi attended the beatification ceremony, along with 300 members of Cope's religious congregation in Syracuse. At the ceremony, presided over by Cardinal José Saraiva Martins, C.M.F., the Hawaiian song "Makalapua" (a favorite of Cope) was sung. Her feast day was established as January 23 and is celebrated by her own religious congregation, the Diocese of Honolulu, and the Diocese of Syracuse. After the announcement by the Holy See of her impending beatification, during January 2005, Blessed Marianne's remains were moved to the motherhouse of the congregation in Syracuse. A temporary shrine was established to honor her. By 2009, the erection of a marble sarcophagus in the mother house chapel was complete. Her remains were interred in the new shrine on her feast day of January 23. In 2007, a statue of her was erected at St Joseph's Church in her native Utica, whose parish school she had attended in her childhood. On December 6, 2011, the Congregation for the Causes of Saints found that a second miracle could also be attributed to the intercession of Blessed Marianne. This finding was forwarded to Pope Benedict XVI by its Secretary, Cardinal Angelo Amato, for papal approval. On December 19, 2011, Pope Benedict signed and approved the promulgation of the decree for Marianne's sainthood and she was canonized on October 21, 2012; a relic was carried to Honolulu from her mother church. After Father Damien, Cope is the second person to be canonized who had served in the Hawaiian Islands. She was both the first Beatification and the last Canonisation under Pope Benedict XVI. In 2014, the church announced that the remains of Saint Marianne would be re-interred at the Cathedral of Our Lady of Peace in Honolulu, which was undergoing an extensive renovation. This is a more convenient location for the faithful than the Kalaupapa National Historical Park on Molokaʻi, where access is primarily by plane or mule train. She sometimes attended Mass at the Cathedral and it was where Father Damien was ordained. The Franciscan Convent in New York which held her remains has had to move to a new location because its former buildings needed extensive repairs. Cope is honored jointly with Saint Damien of Moloka'i on the liturgical calendar of the Episcopal Church (USA). Their shared feast day is celebrated on April 15. Paul Cox directed the film Molokai: The Story of Father Damien (1999). Mother Marianne was portrayed by South African actress Alice Krige. Father Damien was portrayed by David Wenham. ^ a b CNN.com (October 21, 2012). "Mother Marianne becomes an American saint". CNN. Retrieved October 21, 2012. ^ Krista J. Karch (May 11, 2005). "The road to sainthood: Mother Marianne worked years in Utica mills before joining convent". The Utica Observer-Dispatch. Retrieved March 19, 2010. ^ a b "Biography of St Marianne Cope". Sisters of St Francis of the Neumann Communities. ^ "Biography - Marianne Cope (1838-1918)". Official Vatican website. Retrieved March 19, 2010. ^ Mary Laurence Hanley; O. A. Bushnell (January 1992). 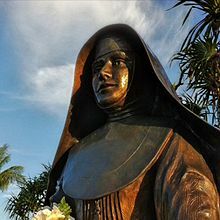 Pilgrimage and Exile: Mother Marianne of Molokai. University of Hawaii Press. pp. 225–226. ISBN 978-0-8248-1387-1. ^ website of the Damien Memorial School, damien.edu; accessed April 19, 2015. ^ "Mother Marianne Cope and the Sisters of St Francis". Kalaupapa National Historic Park website. National Park Service. Retrieved April 15, 2014. ^ "Homecoming for Saint Marianne – Sisters of St. Francis of the Neumann Communities". sosf.org. Retrieved January 24, 2017. ^ "St. Marianne Cope's remains returning to Hawaii". syracuse.com. Retrieved January 24, 2017. ^ "Historical Timeline: A Legacy of Firsts in the Islands". St Francis Healthcare System website. St Francis Healthcare System of Hawaii. Archived from the original on May 2, 2010. Retrieved March 19, 2010. ^ "Last five patients leave Hawaii Medical Center West". web site. Pacific Business News. Retrieved October 22, 2012. ^ "Queen's Medical Center and St. Francis reach agreement on Hawaii Medical Center West acquisition". Hawaii Medical Center West infosite. Pacific Business News. Retrieved October 22, 2012. ^ "About Us: Welcome to Saint Francis School". School website. Saint Francis School. Archived from the original on March 24, 2010. Retrieved March 19, 2010. ^ "History of Cause of Blessed Marianne Cope at the Congregation for Causes of Saints in Vatican City, Italy". Sisters of St. Francis of the Neumann Communities. Retrieved July 8, 2018. ^ "THE BEATIFICATION OF MOTHER MARIANNE COPE". Honolulu Star-Bulletin. Retrieved July 8, 2018. ^ Mary Adamski (May 5, 2005). "'Blessed' Mother Cope: The Kalaupapa nun reaches the second step to sainthood". Honolulu Star-Bulletin. Retrieved March 19, 2010. ^ Shrine of Blessed Marianne Cope; accessed April 19, 2015. ^ Jessica Doyle (October 3, 2007). "Shrine to Mother Marianne honors life of serving poor". The Utica Observer-Dispatch. Archived from the original on September 15, 2012. Retrieved March 19, 2010. ^ "Path to Sainthood Cleared for Blessed Marianne Cope" (news release) Archived April 26, 2012, at the Wayback Machine, The Sisters of St Francis of the Neumann Communities, December 6, 2011. ^ "Father Damien: The Leper Priest (1980)". Internet Movie Database. Retrieved July 21, 2010. Mary Laurence Hanley, O.S.F. ; O. A. Bushnell (2009) . Pilgrimage and Exile: Mother Marianne of Molokai (2nd ed.). Mutual Publishing, LLC. ISBN 978-1-56647-916-5. Wikimedia Commons has media related to Marianne Cope. Blessed Marianne Cope Canonization Director. "Blessed Marianne Cope Cause". Sisters of St Francis, Syracuse, New York. Retrieved March 19, 2010. "Blessed Marianne Cope profile at the". Catholic Saints Info. Catholic Forum.